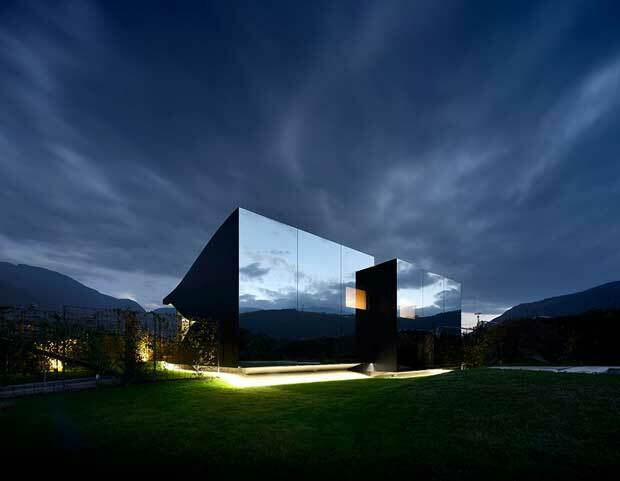 The Mirror Houses are a pair of holiday homes, set in the marvellous surroundings of the South Tyrolean Dolomites, amidst a beautiful scenery of appletrees, just outside the city of Bolzano. They were designed by architect Peter Pichler. The Mirror houses offer a unique chance to spend a beautiful vacation surrounded by contemporary architecture of the highest standards and the most astonishing Landscape and beauty nature has to offer. The client, who lives in a restructured farmhouse of the 60s on the site, asked to design a structure for renting out as luxury holiday units. Guests have their small autonomous apartment and can fully enjoy the experience of living in the middle of nature. A maximum degree of privacy for both the client and the residing guest should be taken into consideration. The new structure is oriented towards east with their private garden and an autonomous access and parking for the guests. Each unit contains a kitchen / living room as well as a bath- and bedroom with big skylights that open to allow natural light and ventilation. A small basement serves for temporary storage. The projects initial volume is split in 2 units that are slightly shifted in height and length in order to loosening the entire structure and articulating each unit. Both units are floating on a base above the ground evoking lightness besides offering better views from their cantilevering terraces to the impressive surrounding landscape. The volume opens towards east with a big glass facade that fades with curvilinear lines into the black aluminium shell. 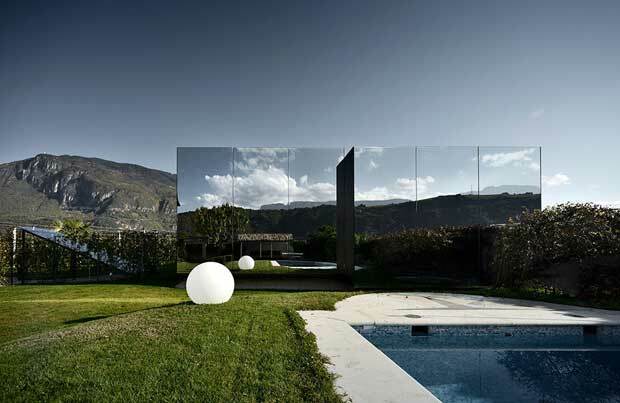 Mirrored glass on the west facade borders the garden of the client with the units and catches the surrounding panorama while making the units almost invisible. The mirrored glass is laminated with an UV coating preventing birds collision. From certain views of the clients garden the old existing farmhouse is mirrored in the new contemporary architecture and is literally blending into it rather then competing against.